Benjamin Orbach has lived in the Middle East for years. Here are his recommendations for hidden destinations off the beaten track. The great pyramids of Giza, the pink facades of Petra, the blue minarets of Istanbul, and the storybook walled cities of Jerusalem and Damascus are some of the highlights that lure travelers to the Middle East. If you make it to these postcard spots, you won’t go home disappointed. But there is a hole-in-the-wall restaurant in Jerusalem called Rahmo, where they serve the best kubbe soup this side of an Iraqi or Kurdish grandmother’s kitchen. And deep in the Western Desert, between the oasis of Siwa and Egypt’s border with Libya, there is a place where the stars shine brightly and rocket across the sky. Whether you are traveling in pursuit of history, good food, nightlife, nature, spirituality, or the journey itself, here are six suggestions for lesser known stops across the Middle East that will make your trip truly one-of-a-kind. In Cairo, Egyptians boast of 7000 years of history. In Jerusalem, Israelis celebrated 3000 years of Jewish history. In Syria, both Damascus and Aleppo claim to be the oldest city inhabited on earth. 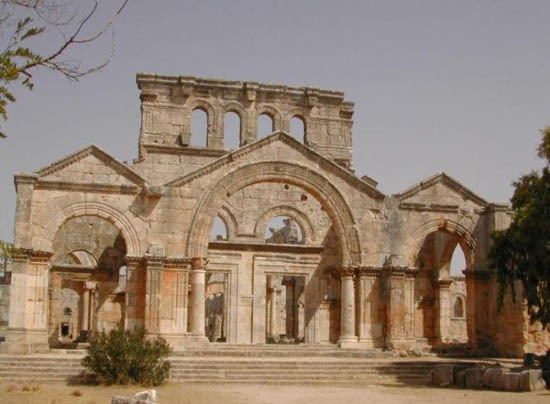 All of these ruins are fantastic, but to get off the tourist trail in your pursuit of history and magnificent ruins, visit St. Siman’s Basilica in northern Syria. Dating from the 5th century, St. Siman’s is not as old as some of the region’s more notable sites, but its triple arched basilica is fantastic, a natural beauty actually – it hasn’t been restored. St. Siman was a shepherd turned ultra pious priest. For 37 years, he stood atop a pillar and preached to the visiting faithful, who had heard of his righteousness from near and far and came in search of guidance and miracles. The lack of tourists, the desert breeze, and the landscape views combine to make St. Siman’s serene. While all that remains of the once 15 meter-tall pillar is a stone nub centered in the courtyard between the ruins of the four basilicas, the place is worth a visit. 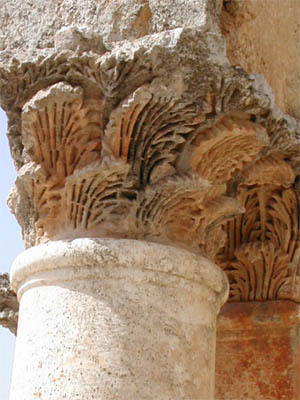 The columns of St. Siman’s triple arched façade are crowned with elephant ear stone leaves that seem to blow in the wind. The lack of tourists, the desert breeze, and the landscape views combine to make St. Siman’s serene. The site is an easy half-day trip from Aleppo, 60km away. The home of slowly roasted meat on a spit, cauldrons of freshly fried falafel, and bowls of humus and sweet olive oil, the Middle East is a foodie’s paradise. Add to the mix mansaf, a communal lamb dish that you roll in your hand with rice and eat standing in a circle or maqlubeh, an upside down Palestinian rice dish with chicken, cauliflower, almonds, and spices, and you find yourself making Solomon-like decisions about what to have for dinner. A lesser known contender to these delicacies is kubbe soup. Rahmo serves Jerusalem’s best kubbe soup and is an institution almost as old as Israel itself. They probably have great kubbe soup in Iraq, but I don’t think it is worth the trip. Instead, go to one of Rahmo’s two locations in Jerusalem. Rahmo serves Jerusalem’s best kubbe soup and is an institution almost as old as Israel itself. The original Rahmo is around the corner from the Iraqi market in Mahane Yehuda, Jerusalem’s bustling open-air market in the center of town. The restaurant is cafeteria style and its clientele are working class; the restaurant cut its teeth feeding workers their meal for the day. While it may be of the people, Rahmo’s food is fit for a king. Ignore the smell of the kerosene burners and enjoy the kubbe soup, a full meal that borders on a holy experience. The new Rahmo is near Zion Square, on Yoel Solomon street, in the center of the city. Conventional wisdom across the Middle East dictates that if you are looking for a party, you should go to Beirut or Dubai. Both are home to beautiful people who spend lots of money in clubs that will make your ears bleed until well past dawn. Make no mistake, if you are traveling to the Middle East for nightlife, Amman should not be your first choice. Still, if you’ve come to Jordan for Petra and Jerash, and you find yourself in Amman on a Thursday night, Nih is where you want to be. Nih is where Amman’s wealthy Jordanian and Palestinian yuppies come to party. Behind a gigantic wooden door and down a flight of steps, there is a secret loungy world where beautiful people dance on tables and eat and drink to their hearts’ content. Located around the corner from the Howard Johnson’s in Shmesani, be sure to arrive early (before 10) or you probably won’t get in. Prices for food and drink are reasonable, certainly better than what you would pay in Dubai. Bedouin plodding through the desert under the hot mid-day sun, they lead their pack-heavy camels by a leather strap. No other image is more associated with the Middle East, than that of the desert. And nothing irritates the people of the region more than the preconception that everyone here rides a camel. Surrounding the region’s deserts, there are crowded cities and small villages built on top of the remnants of great civilizations. And there are green spots and nature reserves, too, especially in the countries of the Levant – Syria, Lebanon, Israel, Palestine, and even Jordan. Visit in the spring and catch the yellow, red, pink, and black wild flowers. For nature lovers who prefer green to brown, and who are looking to get off the beaten path, head to the Golan Heights. Prior to the 1967 war, the Golan was part of Syria; today, it is part of Israel. It takes less than five minutes in the Golan Heights to recognize the land’s beauty and value. The mountains are green, full of water, and overlook Israel’s largest water supply, the Sea of Galilee. The strategic plateau is as close as 40KM away from Syria’s capital, Damascus. Though disputed land, the Golan is entirely safe and home to some wonderful hikes, the best is the very green upper trail of Nahal Yehudia, a national Israeli park. Lined with waterfalls and swimming holes, there is a place where you are forced to jump (or descend a ladder bolted into a giant boulder if you are so inclined) into the cool water below. Visit in the spring and catch the yellow, red, pink, and black wild flowers. Choosing a spiritual place off of the tourist trail in a part of the world full of God is tough. The history of the Islamic Empire resonates throughout the region in mosques that are in many cases each country’s finest work of art. Within a few hundred feet in Jerusalem, you will find the remains of the Jewish Temples, the site of Christ’s resurrection, and the place where Mohammad ascended to heaven in his dream. In my Middle Eastern meanderings, I’ve always found the desert to be a spiritual place. Yet for many travelers, the most ornate or historic place of worship does not necessarily equate to a spiritual experience. In my Middle Eastern meanderings, I’ve always found the desert to be a spiritual place. It is a place that produces dreams, hope, and feelings of supreme humility in the face of overwhelming nature. No desert is prettier than the pink and red Wadi Ram of Jordan. Trekking off the beaten path though, a lesser known, and more traditionally colored spot can be found in the western reaches of Egypt, in the desert surrounding the Oasis of Siwa. At Siwa there is a great sand sea—with crests 20 to 30 meters tall—that blows across the desert plains. Cruising up and down its waves in a four wheeled drive vehicle is fun. Drinking tea at sunset is picturesque. But the real attraction is after hours, in the darkness of night, when the stars shine, suspend time, and inspire belief in a higher power, whether that be God, science, or both. Siwa is two buses and 11 or 12 hours from Cairo, depending upon how many times the bus overheats along the way. While some travel for the destination, others hit the road for the journey itself. Tiziano Terzani wrote a wistful, make you want to grab your backpack and go book called A Fortune Teller Told Me: Earthbound Travels in the Far East, that is really about appreciating the full process of traveling. Terzani eschews flights and instead travels by train and by ship, making sure not to miss anything about the way there. But there are no India-like train trips in the Middle East. And with neighborly relations between many of the region’s countries complicated at best, it isn’t easy to find a desert caravan styled journey that allows you to appreciate the path along the way. Still, in the spirit of traveling to a place and knowing how you got there in every sense, there is a wonderful day trip along the Golden Horn in Istanbul. The Golden Horn, in the heart of Istanbul, is where the Bosphorus meets the Sea of Marmara. Along the Old City’s docks, facing a minaret-studded landscape of Hagia Sophia, the Blue Mosque, and the Suleymaniye Mosque, vendors hawk knickknacks and snacks and commuters stream on to ferries that will take them home. Hop a ferry to Anadolu Kavagi and sit on the deck. For an hour and a half, the ferry makes stops between Europe and Asia. The landscape changes between former crusader forts to shattered docks to the homes of the clearly well-off. Along the way, it is all Istanbul. At the end of the line, hike to top of the hill and the site of the old Yoros Castle. 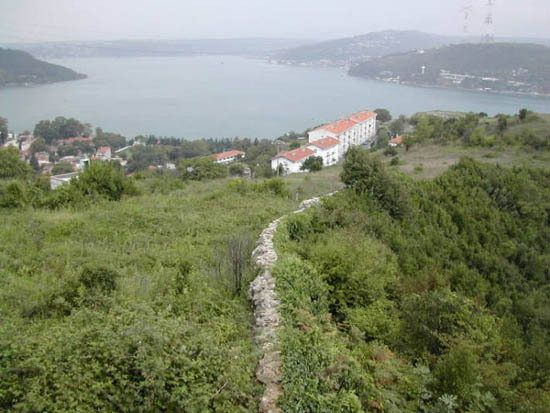 There are stunning views of Istanbul to the west and the Black Sea to the east. 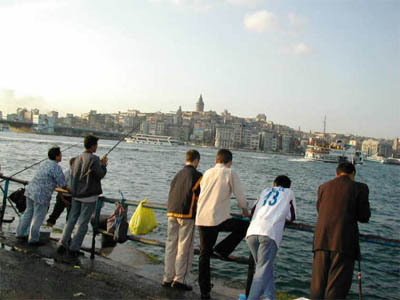 Before returning to the Golden Horn, make sure to stop at one of the fresh fish restaurants along the wharf. Matador is representing in the Middle East. Emily Hansen, is currentlyteaching English in Istanbul – “It’s my New York, but better,” she writes. Forget everything you’ve ever read in the news about Syria. While Syria’s international standing goes up and down (more down than up recently), the people to meet and places to see here never cease to amaze and impress me.